WordCamp Ahmedabad 2018 was our first WordCamp experience. We have been working as an exclucive WordPress service agency since 2012, but never had the opportunity to attend. We are sharing our experience and just to summarise it in one word, it was awe-inspiring. We had no clue what to expect, aside from a day filled with everything WordPress. WordCamp allows you to Learn, Share, Inspire, Create and Connect. WordCamp is literally for anyone interested in WordPress, from designers, to developer, to bloggers/copywriters, to someone that knows nothing about the software. 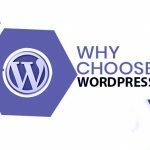 We are sharing our experience as it might be advantageous to new WordPress users, developers, new beginners or anyone who is thinking to attend WordCamp. 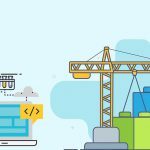 Our experience should encourage more users to connect to WordCamps. Let us first summarise in brief what is WordCamp. We were very excited to attend our first ever WordCamp and reached venue, Pandit Deendayal Upadhyay Hall, Ahmedabad, Gujarat, well on time. We immediately picked up our registration badge, grabbed some breakfast and were ready to attend first session. As we were little early so got some time to interact with some highly esteemed WordPress agencies rtCamp, Multidots, ZealousWeb, WebbyMonks, KrishaWeb, weDevs, Pragmatic Consultancy, WPAllSupport and few other great companies. It was really great and inspiring to talk and interact with these companies. We tried to understand their working process, company environment and their world class offerings and services. We attended all sessions and every session was great knowledge and experience. You can check complete day schedule here. 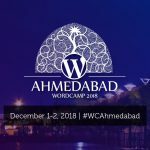 WordCamp Ahemdabad 2018 Schedule. Giving back is very important and contribution day shares all the knowledge and ways to contribute to WordPress community. 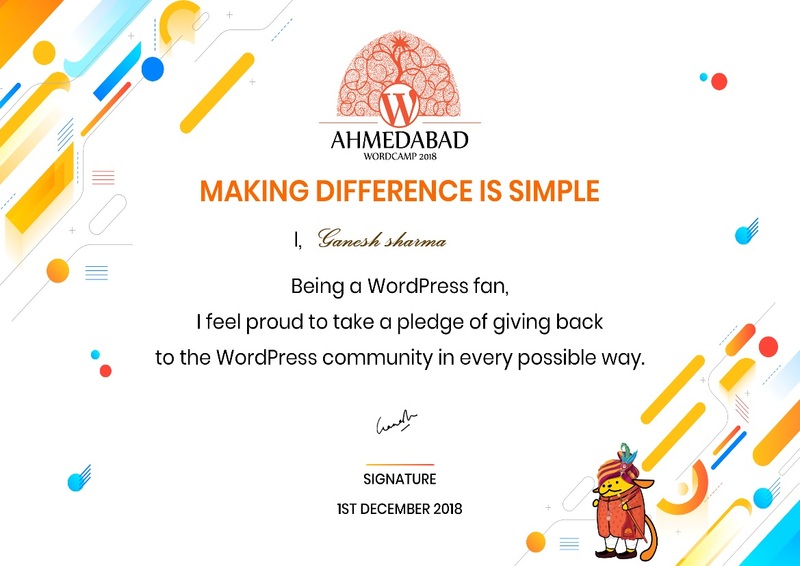 We took pledge to contribute to WordPress Community. You can check complete schedule here. WordCamp Ahemdabad 2018 Schedule. WordCamps is the great place to meet and gain the experience from other experienced ones from the community. Highly experienced speakers are a great source of knowledge and you know about latest WordPress standard, technologies and processes. Connect with WordPress leaders and get help to learn & grow faster. It helps you to build strong network with different member of WordPress Community. WordCamp tells you to contribute back to WordPress Community. You can be contributor to WordPress and get recognition at world level. You can be part of this amazing community as well. All you have to do is show up, and get involved! Visit to as many WordCamps as possible. Please get in touch with us if you need any information about WordCamp or visit this link.